Born January 19, 1946, Dolly Rebecca Parton is a Grammy Award-winning American singer-songwriter, author, actress and philanthropist, known for her prolific work in country music. In the 44 years since her national chart debut, she remains the most successful female artist in the history of the genre, with 25 number-one singles (a record for a female artist), and a record 42 top-10 country albums. She is known for her distinctive mountain soprano, sometimes bawdy humor, flamboyant dress sense and voluptuous figure. She has the distinction of having performed on a top-5 country hit in each of the last five decades and is the only artist to score a No. 1 country single in each of the past four decades. Born in Sevierville, Tennessee , the fourth of twelve children born to Robert Lee Parton and Avie Lee Caroline Owens. Her family was, as she described them, "dirt poor." They lived in a rustic, dilapidated one-room cabin in Locust Ridge, a hamlet just north of Greenbrier in the Great Smoky Mountains of Sevier County, Tennessee, a predominantly pentecostalist area. Music formed a very large part of her early church experience. She once told an interviewer that her grandfather was a Pentecostal "holy roller" preacher. Parton began performing as a child, singing on local radio and television programs in East Tennessee . By age 9, she was appearing on The Cas Walker Show on both WIVK Radio and WBIR-TV in Knoxville, Tennessee , and at 13, she was recording on a small record label, Goldband, and appearing at the Grand Ole Opry in Nashville , Tennessee . It was at the Opry that she first met Johnny Cash who encouraged her to go where her heart took her, and not to care what others thought. The day after she graduated from high school in 1964, Parton moved to Nashville, taking many traditional elements of folklore and popular music from East Tennessee with her. Her initial success came as a songwriter, writing hit songs for Hank Williams, Jr. and Skeeter Davis. Her first country single, "Dumb Blonde" (one of the few songs during this era that she recorded but didn't write), reached No. 24 on the country charts in 1967, followed the same year with "Something Fishy," which went to Number 17. The two songs anchored her first full-length album, Hello, I'm Dolly. Though she was already quite popular, Parton became a genuine superstar in 1977, when the Barry Mann/Cynthia Weil song "Here You Come Again" became a huge crossover hit, reaching number three on the pop charts, spending five weeks at the top of the country charts, and going gold. Its accompanying album went platinum and the follow-up, Heartbreaker, went gold. Soon, she was on the cover of country and mainstream publications alike. Parton's singles continued to appear consistently in the country Top Ten: between 1981 and 1985, she had 12 Top Ten hits; half of those were number one singles. Parton continued to make inroads on the pop charts as well with a re-recorded version of "I Will Always Love You" from "The Best Little Whorehouse in Texas" scraping the Top 50 in 1982, and her Kenny Rogers duet "Islands in the Stream" (which was written by the Bee Gees and produced by Barry Gibb) spending two weeks at number one in 1983. In 1987, along with Emmylou Harris and Linda Ronstadt, she released the decade-in-the-making Trio album, to critical acclaim. The album strongly revitalized Parton's temporarily stalled music career, spending five weeks at #1 on Billboard's Country Albums chart, selling several million copies and producing four Top 10 Country hits including Phil Spector's "To Know Him Is To Love Him," which went to #1. Trio was nominated for a Grammy Award for Album Of The Year and was awarded "Best Country Vocal Performance - Duo or Group." (A second and more contemporary collaboration, "Trio II," would finally see release in 1999 and would be another Grammy-winning success). In 1993, she teamed up with fellow country music queens Loretta Lynn and Tammy Wynette for a similar project, the Honky Tonk Angels album. in 1994 she recorded the Song "The Day I Fall In Love" as a duet with James Ingram for the film Beethoven's 2nd. Parton re-recorded "I Will Always Love You" with Vince Gill, and they won a CMA award for vocal event in 1996. Taken from the album Trio II, a cover of "After the Gold Rush" won a Grammy for Best Country Collaboration with Vocals in 1999, and Parton was inducted into the Country Music Hall of Fame later that year. She recorded a series of critically acclaimed bluegrass albums, beginning with "The Grass Is Blue" (1999) and "Little Sparrow" (2001), both of which won Grammy Awards. Her 2002 album "Halos & Horns" included a bluegrass version of the Led Zeppelin classic Stairway to Heaven. In 2005, Parton released Those Were The Days, her interpretation of hits from the folk-rock era of the late 1960s through early 1970s. The CD featured such classics as John Lennon's "Imagine," Cat Stevens' "Where Do The Children Play," Tommy James' "Crimson & Clover," and Pete Seeger's anti-war song "Where Have All The Flowers Gone." In 2006, Parton earned her second Oscar nomination for "Travelin' Thru," which she wrote specifically for the film Transamerica. She also returned to No. 1 on the country charts later that year by lending her distinctive harmonies to the Brad Paisley ballad, "When I Get Where I'm Going." 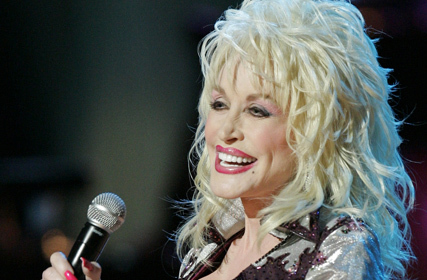 In September 2007, Parton released her first single off her own record company, Dolly Records titled, "Better Get to Livin'", which eventually peaked at No. 48 on the Hot Country Songs chart. Her latest album, Backwoods Barbie was released February 26, 2008 and reached #2 on the country charts. The album's debut at No. 17 on the all-genre Billboard 200 albums chart was the highest in her career. The title song was written as part of the score for the musical 9 to 5, an adaptation of the 1980 movie of the same name. Dolly Parton's net worth has been estimated at between $520 and $600 million, making her one of the wealthiest female entertainers in the world. In 1998, Nashville Business ranked her as the wealthiest country music star. Since the mid-1980s Parton has been praised for her many charitable efforts, particularly in the area of literacy. Her literacy program, Dolly Parton's "Imagination Library", which mails one book per month to children from the time of their birth until they enter kindergarten, began in Sevier County , Tennessee , but has now been replicated in 566 counties across thirty-six U.S. states (as well as Canada ). In December 2007 it crossed the Atlantic when she chose the Yorkshire town of Rotherham to be the first British locality to receive the books, a gesture which did not meet with universal approval within the borough council, where one member objected to a one hour delay in the council meeting so the other members could meet Parton. It has resulted in Parton's receiving the Association of American Publishers' AAP Honors in 2000, Good Housekeeping's Seal of Approval in 2001 (the first time the seal had been given to a person), the American Association of School Administrators' Galaxy Award in 2002, the Chasing Rainbows Award from the National State Teachers of the Year in 2002, and the Child and Family Advocacy Award from the Parents As Teachers National Center in 2003. She was honored as a "Living Legend" by the Library of Congress for her work. The program distributes more than 2.5 million free books to children annually. Her efforts to preserve the bald eagle through the American Eagle Foundation's sanctuary at Dollywood earned her the Partnership Award from the U.S. Fish and Wildlife Service in 2003. She has also worked to raise money on behalf of several other causes, including the Red Cross and a number of HIV/AIDS-related charities. In addition to music, Parton also became interested in acting, starring in 1980’s 9 to 5, 1982’s Best Little Whorehouse in Texas and 1989’s Steel Magnolias. She also opened the Dollywood theme park in 1985, which continues to be one of the South’s most popular vacation destinations.